I remember as a child wearing white gloves for special occasions. I found this beautiful photo of my mother and father. Very Mad Men. 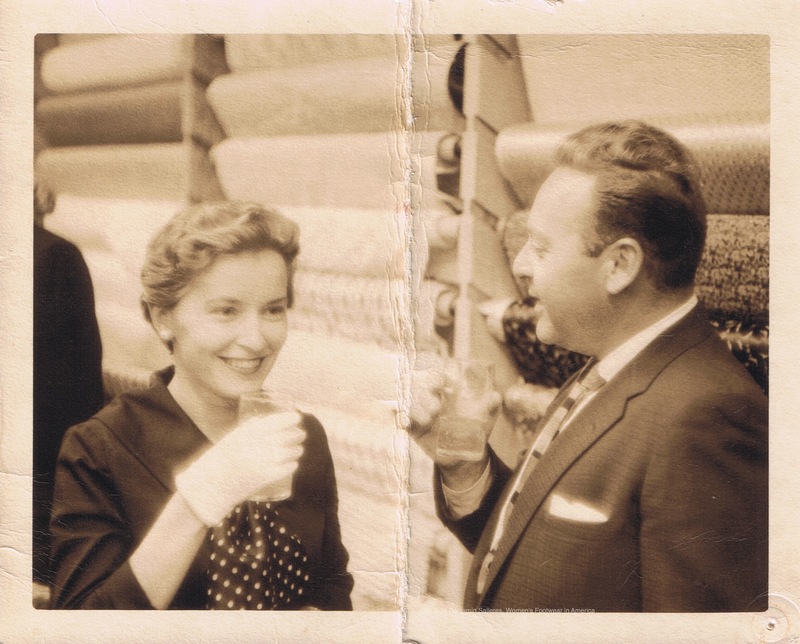 My mother told me it was taken sometime between 1950 and 1954 at a reception in the garment district before they were married. 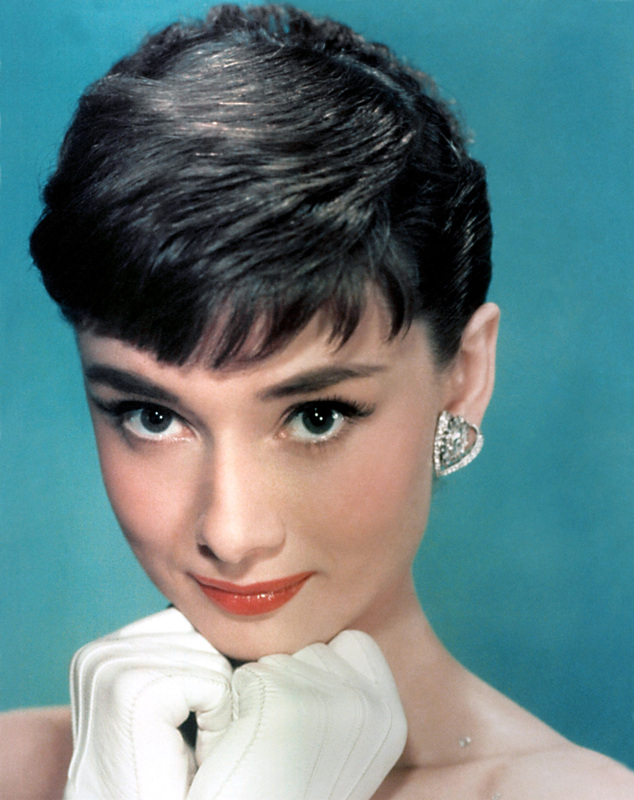 § 19 Responses to When Did Women Stop Wearing Gloves? When I was a girl in the 1950’s we always wore gloves on Easter– and later to to the Proms… Fun post! 1963 was the last time I remember as a child wearing white gloves. Thank you for your comment. Do you remember the occasion? My four sisters and I always wore gloves to Church when we were little. We also wore dresses and black patten leather shoes but I don’t remember when we stopped. I wore the hand-me downs. I think our dress style might have changed after my two oldest sisters left home after graduating and either marrying or going to nursing school in 1964. I love reading your blog – brings back memories and questions for me to ask my sisters who were quite a bit older than me. Thank you for your thoughtful comments. I think it’s so important to ask the questions — my sisters and I have such different memories. I remember wearing white gloves in the early 70s when I was very little. I wore them to church for special services such as Easter, Mother’s Day, and Christmas. I wore them in the mid-80s when I was a teenager for a fashion show with a strapless dress. I had a pair of lace fingerless gloves I would wear for “everyday”, that was influenced by Madonna back in that time. I’d love to see pictures! Thank you for sharing! Why didn’t you answer the question? I wore them at my wedding in 1970. Did they actually make it into the ’80s for special occasions? It seems the last first lady to wear them at an inauguration was Nancy Regan, and only the first one. After that they wore leather gloves with their coats, not fashion cotton gloves. I did however find a photo of Amal Clooney at the Golden Globe awards with elbow length white gloves with her black gown. Thank you for commenting. To answer your question, I think your memories are much more interesting. I remember wearing them to church on Easter Sunday till about 1965. But I also remember asking my Mom why we didn’t wear them every time we went to town. My answer is “between 1973-1975” and here’s why. I’d have to say that for ordinary women (not movie stars or state officials at official functions) wearing gloves- from what photos tell me and what I remember- and here’s some rationale – roughly correlates to the time when women (by and large) started wearing pants: eg jeans or casual slacks for everyday, more pantsuits or dress slacks for work- and at that same time (and here’s the goves-correlate I think) – stopped wearing previously mandatory or standard ‘foundational undergarments’. I think foundational undergarments and etc themselves and when we stopped ALWAYS wearing the mandatory girdle- correlates to the invention of mass-market pantyhose. But I think the death of gloving more strongly correlates to the emergence of pants as acceptable and even standard formal for work. I think wearing gloves to work long preceeds the mid 80’s (ish?) when even pantyhose fell off workplace dress codes.I’ve seldom, if ever seen a non-military woman in the early 70’s IN pants or a slacks-based work suit, wearing gloves. That was also when my mother switched to the ‘slacks’ option as a Girl Scout Leader (GirlScouts is a good index for formal mandatory ‘proper women’ wear. Not ultra-conservative, but just – what any religion or culture followed for ‘how to raise or be a responsible girl or woman in society’.) I think she carried gloves with her slacks uniform ‘just in case’ but wore them ONLY during the ‘flag procession’ (you always wear gloves carrying a flagpole- it’s a ceremonial but also a practical glove-use.) She always wore dresses to formal occasions but that’s around the time (73-75) when suddenly that entire drawerful of blandly coloured ace-bandage-grade ‘girdles’, and the stopped getting opened. Women didn’t have to put on a big ugly bra and giant tight girl to cram into a dress – just to go to the store. Trousers were fashionable and smart, jeans were still for ‘the country’ or etc, but pedal pushers, comfy cotton trou- you could run the to the store or pick the kids up from school without bulking into a dress and making sure to choose some nice gloves. After that the women in ‘pants AND gloves’ seems to be confined to military and equestrian pursuits, or specialty events among Hollywood or higher society. You just don’t see a lot of women wearing gloves with slacks- my mother abandoned the girdle and heavy ‘girdle-bra’ and foundational undergarment at roughly the same time she abandoned the glove draw, and while she was a slacks early-adopter (as ordinary housewives go) by 1975, it’s hard to find even ordinary-people wedding photos, where MOST of the women are wearing gloves- even though they are all or almost all, in dresses and otherwise ‘formalwear’. I take it were are not discussing what Hollywood, or state functions or royalty does on ceremony. I’d say- look at your family photos or shots. Up with pants, down with (girdles and) gloves- regional variations but nationally and internationally- about ’73-75. Thanks for the great post. Lots of good information. We wore white cotton gloves to church every Sunday in the 60’s, but not to school. I think we stopped wearing them around 1970 or so. I was 8 years old then. Not sure why. We just didn’t have to do it anymore. My younger sister and I were so glad. I remember, to wash the gloves, my mother would have my sister and I stand on stools at the sink in the bathroom when we were not tall enough to reach the sink. She then had us put our gloves on our hands and get the gloves wet. I really did not like how this felt on my hands. She then poured detergent (Woolite) on our hands and told us to wash the gloves as though we were washing our hands. I really disliked this chore, and really did not look forward to doing it when we were pulled away from playing to do it. Usually, my sister and I would make bubbles and hit our gloved hands on each other to get the bubbles all over the other sister. We tried to do this without our mother hearing, because if she did, we would be reprimanded. When my mother was a young woman before she married, she was a secretary at a business, when she graduated from high school. She took the train every day “downtown” to work. She said it was a fashion mandate to wear white gloves every day. She said the gloves had to be washed every day because they got so dirty with every thing that they touched. She said she only had 2 pairs of gloves, so she had to wash a pair every night and leave it over the shower curtain rod to dry overnight. She said her brother, my uncle, asked her one year what she would like for her birthday, and she said more pairs of gloves, so that she wouldn’t have to wash every single night! She got the gloves as a gift from him. She was happy. I don’t think any of us were really too sorry at the time, when we didn’t have to wear gloves anymore. 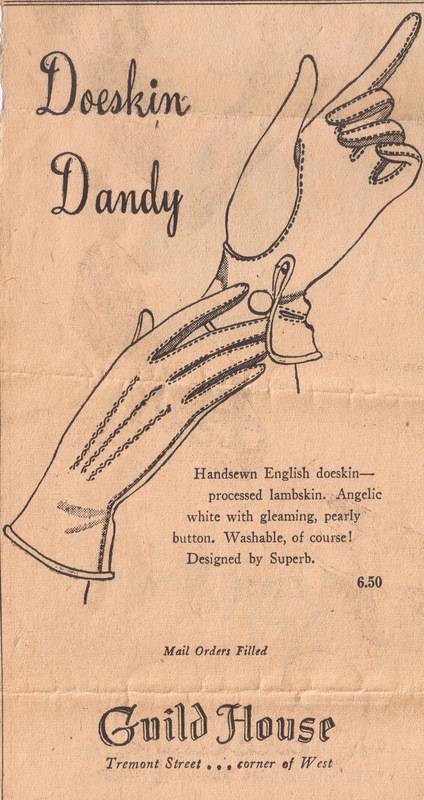 You are currently reading When Did Women Stop Wearing Gloves? at Women's Footwear in America.